The ability to automate certain time-consuming tasks is one of the things that drives business owners to transition from in-house accounting to an online provider like More Than Accountants. Automation is a wonderful thing. For example, consider reconciling your accounts with our automatic bank reconciliation tool. You will never look at daily reconciliation the same way again. Automatic bank reconciliation saves a tremendous amount of time. Rather than having to manually reconcile individual transactions to account for your legacy double-entry system, automatic reconciliation uses transaction data from your bank to do everything automatically. Our online software platform downloads the information and applies it across the accounting environment. That alone is enough reason to use auto bank reconciliation. But there’s more. Automatic reconciliation also reduces human input errors. 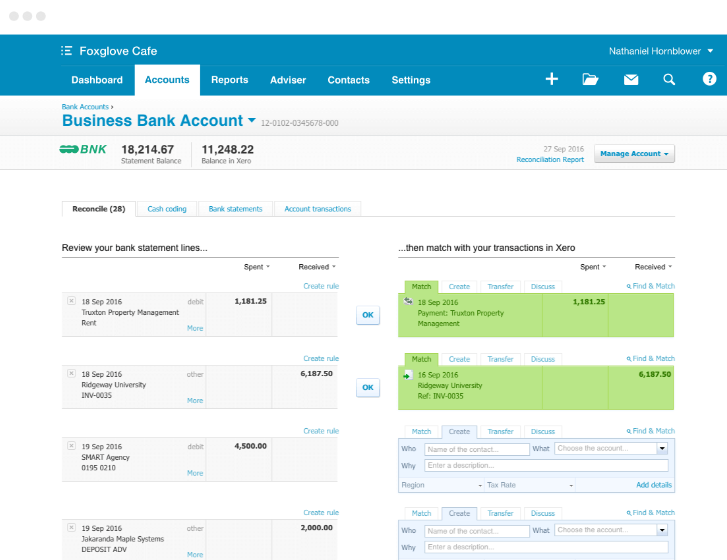 It gives business owners a more accurate view of their accounts in real time. It even allows a business owner to reconcile accounts at the start of each day so as to instantly know where the business stands. Making all this work requires a permanent connection between your bank and the software. So just go to the accounts section of the software and enter the information. In just a few minutes, you will have instant access to daily bank transactions that will automatically be imported into your software for reconciliation purposes. Once the connection is made, it only takes one click of a button to connect to your bank and download transaction data. If you have more than one bank account, that’s no problem either. You can create connections to as many accounts as necessary. The second step is to create rules that will tell the accounting software how to match bank transactions to the transactions in your accounting software. You will be matching transactions to purchases, bills, invoices, etc. The great thing about rules is that these can be customised to your business. You do not have to rely on a set of generic rules that may or may not work for you. Once your rules are set up, daily reconciliation is virtually seamless. The final step is to create rules that govern bulk transactions. Why are such rules necessary? Because bulk transactions may be processed differently than individual transactions. A bulk transaction rule could be just about anything. Cash coding would be one example. A cash coding rule could be used to reconcile multiple transactions in a single category while simultaneously applying any applicable bank rules. Note that setting up the rules is no more difficult than what you will have already done for individual transactions. Daily account reconciliation is something you should already be doing just to keep track of where your business is day-to-day. We make daily reconciliation easier through our automatic bank reconciliation tool. This tool is your key to daily reconciliations that are faster, more efficient, more accurate, and capable of giving you a real-time picture of where your business stands. If you are not yet a More Than Accountants customer, we encourage you to give automatic bank reconciliation some serious consideration. It is just one of the many tools we provide customers looking for a better way to handle accounting. If that sounds like you, we would be interested in speaking with you. We can offer you an online accounting solution that will completely revolutionise the way you keep track of your business financials. See our accountancy packages or contact us to get started.